The Romans were well known for their lavish and distinguished lifestyles, their fashion sense too was beautifully constructed and a statement of their wealth and sophistication. This Roman fancy dress costume will instantly turn you into a beautiful roman beauty and comprises of a stylish white knee length toga with gold trim detailing to the neckline, a blue drape that can be worn over the shoulder and a blue and gold coloured belt. The Roman fancy dress costume is completed with a gorgeous gold leaf headpiece. You'll have even the most hardened Roman Emperor swooning after you in this superb fancy dress costume. 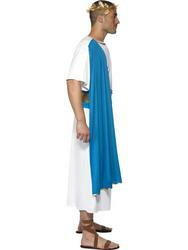 Perfect for any fancy dress party, especially one with a historical or Roman theme.